Our comprehensive and easy-to-use online programs plus paper based manuals are preferred by employers and trainers across the country. Workplace Hazardous Material Information System (WHMIS) training is required in many industries including pulp and paper, waste water treatment, geophysical/seismic and the petroleum industry just to mention a few. Our WHMIS Online Training course is 100% online with no need to ever step foot in a classroom. We also offer courses for Transportation of Dangerous Goods, Fall Protection Awareness and Lift Truck Safety. 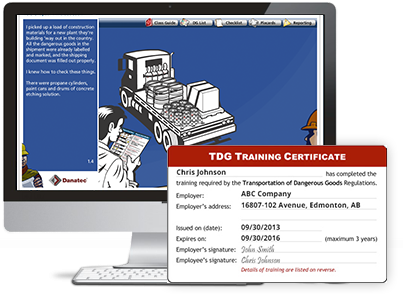 Whether you or your users are located in Calgary, Edmonton, Fort McMurray or even on the road, you or your staff will be able to complete their training so long as there is access to a computer and an internet connection. Your training history is stored permanently in a secure facility and is available for your reference at any time. This information is never deleted and is made available on demand if there is ever a need to reference your training history or print off new certificates. Employee and personal training records are kept on file and made available to you at all times. This information may be exported from your account at any time to provide proof of training history in case of audit.